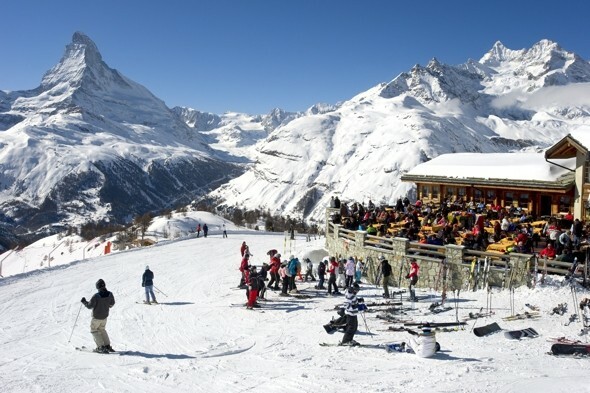 British tourists are among those who have found themselves stuck a the Zermatt ski resort in Switzerland after an avalanche blocked them in. Snow covering train tracks and roads leading in and out of the ski resort are covered, and helicopters have not even been able to take off, according to the Mirror. A spokesman for Zermatt Tourism said rail staff were unable to remove enough snow from the train tracks to make them operable. British tourist Belinda Hadden and her friends missed their flight back to London today. She said there are "worse places to be trapped", but told the paper: "I had no idea until I went to the train station and was told there was no way I was getting out. "There hasn't been snow like this since 1999, there's been a metre alone today." Zermatt Tourism said the situation would be assessed at 8.30am tomorrow morning. Zermatt is a beautiful mountain village with no cars and cobbled streets, and sits in a deep valley dominated by the graceful curves of the majestic Matterhorn. This pretty resort was first put on the ski map when it hosted the Winter Olympics in 1936, and it continues to be a hotspot for pros. In 2011 it hosted the Alpine World Ski Championships, so it's perfect for speed freaks! Andorra's newest ski area nestles in one of the country's most beautiful mountain valleys. It offers modern lifts and some of the more challenging skiing in the area – so it's perfect for the more experienced skier. Hotel: £114.51. Ski hire: £12.24 Ski pass: £32.63. Meal: £6.87. Beer: £1.29. Germany's most southerly resort sits in beautiful Bavaria and is closely linked to the huge Austrian ski area Kleinwalsertal - so you can ski two countries in one day. Perfect for mixed ability groups. Hotel: £101.28. Ski hire: £19.18. Ski pass: £34.35. Meal: £9.62. Beer: £2.52. The beautiful lakeside resort of Bled is close to three ski centres which are linked by a free bus. With a number of floodlit pistes, it's perfect for fans of night skiing. Hotel: £101.65. Ski hire: £15.46. Ski pass: £26.19. Meal: £8.53. Beer: £2.34. This little place is part of the huge Grandvalira ski area, so it offers access to 192km of piste liked by a high speed lift network. Perfect for lovers of lively apres-ski. Serre Chevalier is part of a huge south-facing valley offering access to the second-largest ski area in the world, so there's enough skiing to keep all levels happy. Perfect for families. TripIndex total cost per day: £153.70. Hotel: £81.98. Ski hire: £18.03. Ski pass: £36.67. Meal: £13.45. Beer: £3.57. Perched on the edge of a beautiful national park close to the Austrian border, the majestic peaks surrounding Berchtesgaden provide 50km of downhill pistes, some of them floodlit. Perfect for scenic skiing. Hotel: £97.96. Ski hire: £15.46. Ski pass: £25.07. Meal: £9.16. Beer: £2.66. It may have been a tad active in recent months, but skiers still delight in taking to the slopes. The north run ends at the pretty resort of Linguaglossa, and south which leads to Nicolosi. Perfect for a weekend ski break. TripIndex total cost per day: £117.73. Bansko boasts the best snow record and longest ski season of all Bulgarian resorts - and, as it recently benefited from a multi-million euro investment, it's the place for budget skiers this year. This small but busy village offers the widest and longest slopes in the Pyrennes. Hotel: £121.53. Ski hire: £18.63. Ski pass: £36.92. Meal: £5.58. Beer: £1.72.